When Can You Safely Give Your Baby Water to Drink? Is it necessary to have babies drink water when they are 6 months old or when the weather is hot? Does your baby need water during the hot months of summer? Do babies need to drink water anytime? While breast milk is approximately 88% water, formula is not and many pediatricians will recommend that formula fed babies be given sips of water from 6 months of age or when solid foods are introduced. Letting babies drink water is a recommendation only and it really is not needed. The recommendation is not intended to be taken as an absolute directive that you must offer your baby water. Water in a sippy cup is the perfect liquid to use when introducing the sippy cup. Add some ice cubes to give the cup a more interesting flair. Please use extreme caution when offering infants water. Infants who drink too much water may come down with Water Intoxication. For children under 1 year old – and especially during the first nine months of life – drinking too much water may be a dangerous practice. In fact, according to pediatricians like James P. Keating, MD, medical director of the St. Louis Children’s Hospital Diagnostic Center, “too much water dilutes a baby’s normal sodium levels and can lead to seizures, coma, brain damage and death. For those parents who are having their infants under the age of 12 months old take swimming lessons, please be cautious of the amount of water that baby may inadvertently swallow. Water intoxication may also occur due to a baby swallowing too much water when swimming. Remember: the best way to give baby fluids is through breast milk or formula. 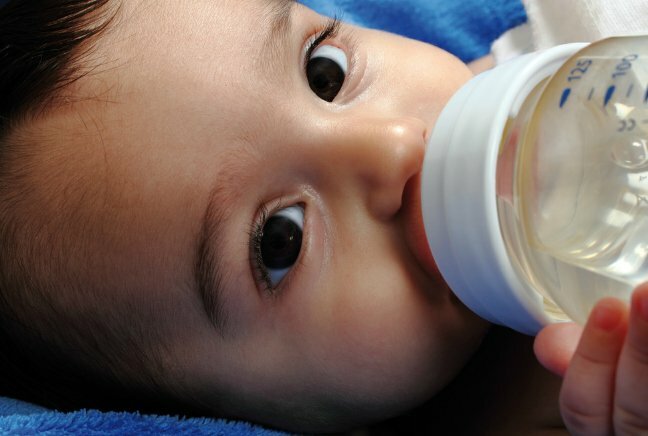 Over-diluted formula can also lead to water intoxication in babies. TIP: A great way to get baby into using a sippy cup is to fill it with water and ice. The ice will make noise as it sloshes about and pique baby’s curiosity. The water is better than juice and giving water over juice will instill a love of this healthy and necessary liquid! Dr. Alan Green in NY Times- Is It Safe for Babies to Drink Water? WomensHealth.gov – Does My Baby Need Cereal or Water?